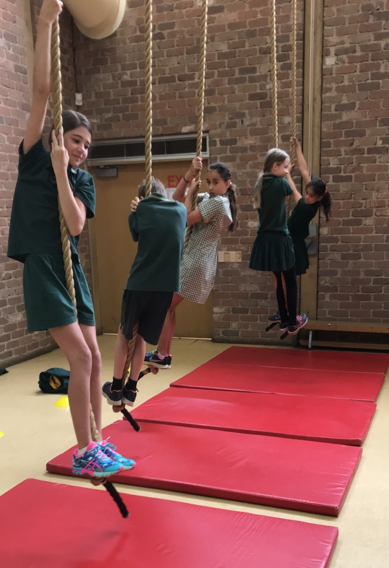 Eltham North Primary School provides a high quality Physical Education program for every child. It is designed to prepare students for a healthy and active lifestyle through the development of skills, knowledge, teamwork and positive attitudes. Our comprehensive program provides children with a wide range of physical and sporting experiences focusing on the sequential development of fundamental motor and locomotion skills, gymnastics, dance, athletics, fitness and sport education. To implement the P.E. program, we have access to excellent facilities including a hall, nearby oval, basketball, netball, volleyball and bat tennis courts. We also have a range of equipment that ensures a variety of exciting new experiences each session. Various lunch time and after school coaching programs are also offered throughout the term. Our specialist Physical Education teacher, Sarah Van Nieukerk leads skill based Physical Education programs with Prep - Year 6 children each week. Children in the junior school will learn and practice the correct techniques for running, hopping, jumping, skipping, catching, throwing, kicking, rolling, balancing, twisting and turning. While those in the middle and senior school will develop the capacity to link these skills into more complex and coordinated movement sequences. As students develop increasingly complex motor skills, they will be given opportunities to then apply these to appropriately modified games and sport-specific settings. The children enjoy having these goals and often relate back to them to see how they are progressing throughout the year. Students will have a busy semester that includes team building, lacrosse, fitness, athletics and skipping sessions. The senior students have units to complete in team building, lacrosse, fitness, athletics and skipping sessions. Be part of the School Inter-School Sport competition in Term 2 & 3, training for one hour on a Monday and playing for two hours against another school on a Friday. Year 6’s make up the majority of the teams while year 5’s are selected to fill in when required. The House Captains and Vice Captains are valuable representatives of our school. School-based house competitions in swimming, cross country and athletics are conducted each year to promote a sense of community and connectedness. In Term 1 of each year we hold our School Swimming Sports at Aquarena, Doncaster. The participation of Year 3-6 children is growing each year and this year we expect 320+ students in attendance. In March we have our School Cross Country at the North Eltham Park and trail. All Year 3-6 children will participate in their own age group. The top 6 in each age group and gender proceeds to the Eltham District Carnival in May. In Term 2 we held our School Athletics Carnival at Tom Kelly Athletics Track in Doncaster. All Year 3-6 students attended and competed in a variety of track and field events. They learn and train in each of the events during Phys Ed classes in the weeks preceding the carnival. A select few will then be selected to participate at the Eltham District Athletics Carnival in August. We thank all teacher and parent helpers that make these days run as smoothly as possible. In Term 2 we have a three week skipping program leading up to our “Jump Rope For Heart” Jump Off in June! Skipping is an excellent way to promote fitness and co-ordination whilst having fun and raising money for a worthy cause. This program is organised, managed and run by students during the weekly sports time (Friday afternoon) and will involve the children completing a kickball round robin in term 1 & 4. The children play, score, umpire and coach. Our school is affiliated with School Sport Victoria in the Eltham District and will play against other teams within this district in Term 2 & 3. Equal opportunity for both girls and boys is provided and good sportsmanship and fair play through healthy competition is promoted. Inter school sport is a highlight for most students in Years 5 & 6. Football, soccer, netball, bat tennis and korfball are the Winter sports and they are played in term 2. Summer sport is in Term 3 and there is the choice of bat tennis, volleyball, rounders, softball and basketball. Different captains and vice captains are chosen each week. Their role is to welcome the other school and write a sports report.